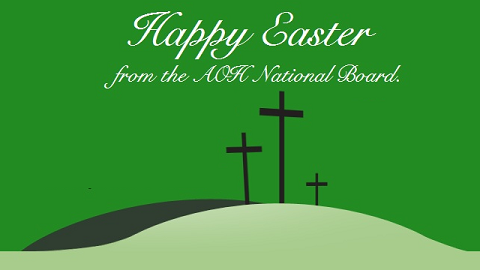 Happy Easter from the AOH National Board. Suddenly all becomes affirmed and confirmed. No more doubts for them OR US!! Christ is risen from the dead, Alleluia! May Christ raise each and everyone of you to New Life this Blessed Easter Season. Be assured of my prayers for all of you and your loved ones. Rev Timothy J Harris, T.O.R. of all His children this blessed day. Rev. Martin J. Burnham, P.S.S. Father was willing to sacrifice His own Son to save us all. Order – Friendship, Unity & Christian Charity.